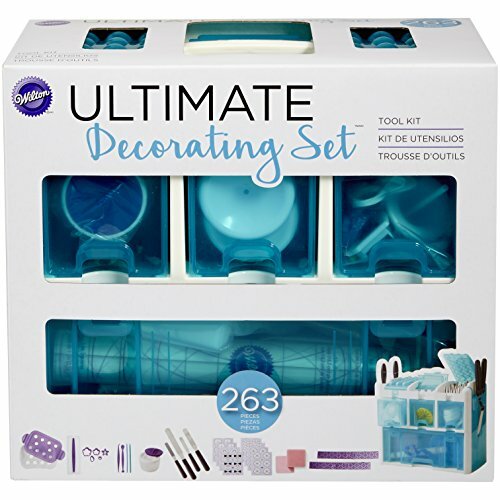 We've updated our ultimate decorating tool set and given you more tools than ever for an even bigger value. Whether you are just starting to step into the world of cake decorating or you've been at it for a long time, this kit is a game changer. With 263 pieces for creating cake decorations with buttercream, royal icing, fondant and gum paste, you won't ever be without the tools you need to make your cakes a true work of art. Plus, the caddy now has see-through drawers so you can peek inside and grab what you need quickly. Buttercream decorating accessories include an assortment of decorating tips, decorating bags, straight and angled spatulas, flower nails and icing comb. Fondant decorating accessories include fondant Roller, fondant cut-out sets, impression mats, fondant tools and decorating brushes.